This is the second in a series of posts about the current appearance of this blog. The first post explains why I’m blogging here at WordPress.com, and using the Simpla theme. This post is about Custom CSS. 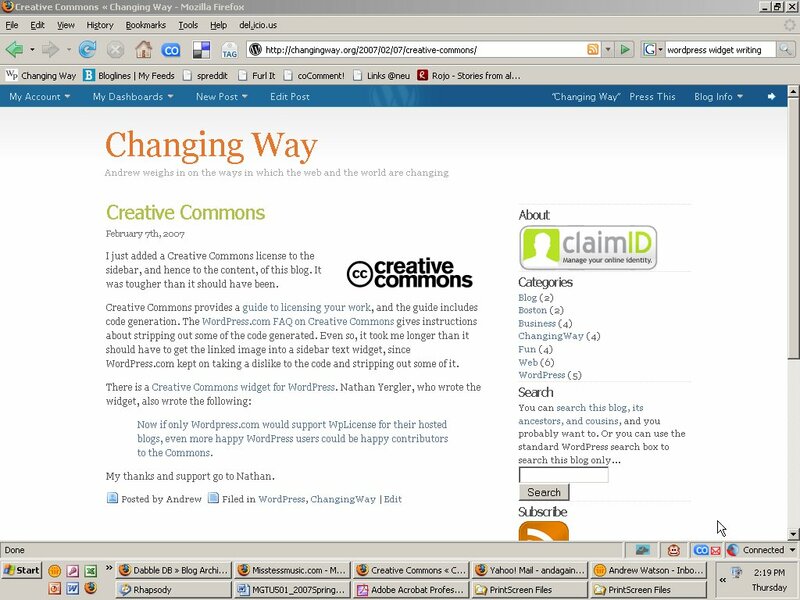 Although blogging at WordPress.com is free of charge, there is a charge for custom CSS. For me, control over my blog’s style sheet is well worth the ~US$1/month; for others, it’s not worth it. If you have a WordPress.com blog, you can go from Dashboard to Presentation to Edit CSS, and preview the feature. Note that: “Your stylesheet will be loaded after the theme stylesheets, which means that your rules can take precedence and override the theme CSS rules.” Most of my stylesheet came from cutting and pasting from the Simpla stylesheet, and replacing values. But the CSS for images came from the stylesheet for my previous blog. I like images at the right of posts, with a little room to breathe. I wanted the main heading for the blog to be more prominent than the Simpla default, so I made it twice the size of the post heading. I wanted the date of each post to be formatted consistently with the post metadata that appears at the foot of the post. In fact, I think that the date is post metadata, and as such belongs with things like the category. But CSS doesn’t control the placement of text, just the style. So the best I could do was copy and paste the formatting from the post metadata to apply it to the date. Turning now from the content to the sidebar, the Simpla CSS gives too much separation between the items on the Blogroll list for my taste. So I took out the dotted line it uses as a separator. But I used it to separate sections of the sidebar from each other. Mention of the sidebar brings me to sidebar widgets, and to the third post in the series. can you help me to get rid off the “file in” and “postet by” underneath the posts? is it anything else you think my blog needs to fix? By sort of worked I mean that it leaves a gap where that post metadata used to be. Your blog looks great. I would move your subscribe to feed icon further up, but apart from that, I don’t see anything I want to change. then i tryed to change fontcolor under “superjanne” from grey to red but i cant find the code. what entrycolor is the right?